Basic Advice New carpets require new underlay, this is extremely important not only to the life of any carpet, but also to the warranty offered by the manufacturer. You would not buy a brand new car and ask the dealership to fit your old tyres, using old underlay for your new carpet makes equally little sense. When choosing underlay, buy the best that your budget will run to, it will pay dividends in the long term. The higher the density of the underlay, the better support it will give to your carpet in terms of longevity and appearance retention. Consideration should also be given to purchasing the correct underlay for the installation. Foam underlays tend to have higher thermal insulation values so are good for retaining heat, but for areas with underfloor heating a suitably low tog underlay must be used for the heating system to be effective. Woven secondary backed carpets require to be stretched evenly across the room from wall to wall. For the best results a new underlay should be laid on a clean dry floor, on flat surfaces the underlay should be fixed using a good quality single sided tape, with joins butted together, on stairs the underlay should be fixed using staples or tacks where the surface allows. This will stop movement of the underlay when the carpet is laid. The carpet should be stretched evenly and held on carpet gripper which has been pre-nailed to the perimeter of the room. This will ensure the pile of the carpet will sit upright, giving the best resilience to foot traffic. 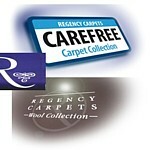 This also helps to reduce the wear of the carpet. Maintenance Having purchased a new carpet, it is natural to want to maintain its initial appearance as long as possible. The key to good carpet maintenance is to avoid particles of loose dirt and dust from working their way into the carpet pile where they will act abrasively on the fibres and discolour the carpet. Vacuum new carpet regularly at least two or three times a week. A large, strong doormat will reduce dirt from outside being spread around the house. Avoid where possible laying light coloured carpets next to external entrances. For loop-pile carpets, cleaners with rotating brushes should not be used, or should only be used after the brushes in the head have been retracted. Additionally, the Velcro strips commonly found on the heads of many vacuum cleaners should either be removed or taped over. Failure to follow this advice when cleaning loop pile carpets may cause pilling and/or a general fuzzing of the surface texture of the carpet pile. Wool has built-in natural soil and stain resistant properties. Compared to other fibres, wool releases soil more easily in cleaning, and responds particularly well to vacuum cleaning. Dirt and spillages may be spot cleaned off a wool carpet more easily than off synthetic carpets. However, it is still necessary to prevent soiling as much as possible and to follow a regular cleaning schedule. Cleaning These are general rules for dealing with spillages. For more persistent or unusual stains contact a professional carpet cleaner. Spillages are more easily removed if tackled immediately so act promptly and blot off all the liquid stain with dry kitchen roll or a clean dry white cloth. Semi solid substances should be removed with a plastic spatula. To clean off any remaining stain use a clean damp cloth soaked in warm water to blot the stain. Use a dabbing action with the cloth and then blot out the remaining liquid with dry kitchen towel. Do not rub the pile surface of your carpet or oversoak the stain and always work from the outside of the stain inwards to minimise the stain spreading. If the above action is taken quickly, little penetration should have taken place and a final wipe over with a damp cloth, leaving the pile sloping in the correct direction, may be all that is needed to remove the stain. Water-based stains: e.g. tea, coffee, fruit juice, wine. Always clean up a spill immediately. Do not spread the spill. If liquid, blot up as much as possible with a clean absorbent cloth or tissues. Blot until no more liquid is easily removed. If a stain is still apparent, dampen the area with clean water using a clean cloth or sponge without overwetting. Repeat blotting. If a stain is still apparent dampen a cloth or sponge with water and a good proprietary brand carpet shampoo (diluting according to label). Apply to the stained area and blot until the stain has been removed. Then re-wet the stained area with clean water until all the shampoo has been removed. Blot dry the area with a dry cloth or tissue. When the clean spot is almost dry, gently brush the area in one direction (high pile carpets only). N.B. Some substances contain chemicals or bleaches which can permanently mark some carpet fibres. Appearance All carpets using a spun yarn will shed excess fibre when first installed. This is to be expected and does not mean there is a defect. The short fibres given off, represent a very small fraction of the pile. As a natural fibre, pure new wool is washed and scoured before being spun into carpet yarn. Throughout the manufacturing process it is also inspected and natural minor imperfections removed. Even so, fitted wool carpets may, on rare occasions, contain slight traces of the sheep's outdoor environment. Cut pile carpets after use can develop light and dark patches, known as shading. This is as a result of the pile surface laying in varying directions, and the light refraction on the surface of the pile creating a 'shaded' appearance. Shading is not detrimental to the wear of the carpet. Most textiles will fade very gradually over time due to natural light. To reduce fading of carpets in rooms with strong exposure to the sun, (i.e. south facing rooms with patio windows), judicious use of sun blinds or curtains is recommended. Pet paws, claws, rubber soled shoes and heels can be abrasive on carpets, particularly where use is constantly concentrated to small areas (i.e. in front of armchairs). Move furniture occasionally to avoid any distortion to the carpet pile. Pilling can sometimes occur on loop pile and wool blend carpets. The expression is used to describe the little balls of fibres which collect on the pile surface. It is similar to the type of pilling which can occur on a sweater. Carefully remove these pills with scissors - the durability of the carpet will not be affected. Identical matching between consecutive production batches is not possible and nominal deviation from original samples and patterns must be anticipated. It is therefore recommended that an installation is planned from one width. The feet of furniture will create indentations on any carpet. To help reduce marking, regularly move the position of furniture and other heavy objects where possible. To help lift the pile back up, use a coin to 'gently' tease the pile upright. When the atmosphere is dry, static electricity can build up in a carpet. This may be rectified by keeping the humidity high with a humidifier or indoor plants in water trays. All cut pile fabrics of any fibre type will flatten to some extent in traffic lanes although regular vacuuming will help to allay this. This flattening is a normal reaction to localised traffic and is not detrimental to the wear of the carpet. Stair carpets receive heavy wear especially on the nosings. In some cases shifting the stair carpet can help compensate for this. Care must be taken if applying stain guards or other such treatments after installation. Over saturation can result in damage to the structure of the carpet. Disclaimer The above is to be regarded as general guidance only, characteristics of carpet fibres will vary from type to type, Spectrum floor-site Ltd, it's agents and employees will not be responsible for any inappropriate use of the advice given above, nor for any misuse of such advice. If in doubt, consult a professional carpet cleaning contractor for individual advice on spot and stain removal.